Join us at the Emerald Coast Dragway on Saturday November 17th for the 1st Annual Fall Nationals Monster Truck Showdown – Presented to you by Emerald Coast Harley Davidson and SunCoast Converters!!! For the First Time Ever !! 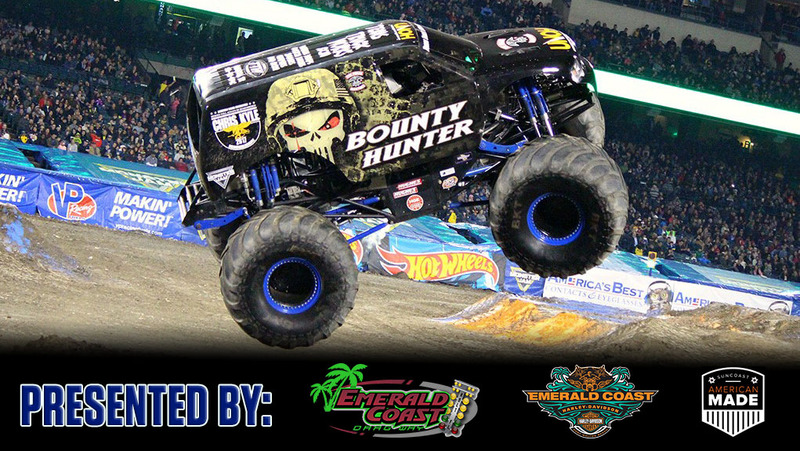 ” THE MONSTERS ARE COMING”..America’s Biggest & Baddest Monster Truck Show..
is coming Ft. Walton Beach area !! Enjoy All the Fun & High Energy Excitement !! get sum BIG AIR !! QUADS battle it out on fast track for Big Cash Purse & Bragging Rights ! Admission – limited supply – get’em while they last !! Pre-show Pit Party Tickets available only at Merchandise Std. selling rides throughout the BIG Show ! * plus MOTORSPORTS TEAM RACING..see QUADS battle it out-who’s gonna Win ! (Value $5.00) Limited Supply of VIP tickets – Get’em while they last ! !